All images by Lisbeth Cheever-Gessaman. Hello, beautiful! My name is Lisbeth Cheever-Gessaman, and I’m a visionary artist specializing in expressions of the Divine Feminine and alchemical transformation. I create all of my work under the name “SheWhoIsArt”, and relate very much to "She Who Is" both for personal reasons, and because it removes the immediate ego between me and my art. There's a very real sense in me that who I am when I create dwells in a mystical realm of the Divine Feminine, and "She Who Is" defines that realm in me. In turn, that realm is what I draw from and strive to manifest on this earth as a form of magical and sacred expression. Subjectively, my work is important because it’s the center and soul of who I am in this incarnation. More objectively, I live and create in the transformative realm. I believe in the alchemical power of magic, myth, spirit and enchantment, not just as fantastical constructs, but as aspects and places of being which serve to guide us, heal us, inspire us, teach us. I use art to bring that world to life - as inspiration, healing and transformation. I also work in many layers - I’m very woowoo. I use astrology, numerology and sacred geometry as well as principles of magick and spirituality in everything I create. Everyone is ideally my client, as we are all humans sharing this temporal experience of life and beauty, and all desire to be moved through the spirit in some way. Most of my client base believe in those same principles, but it manifests in ways which defy demographics. 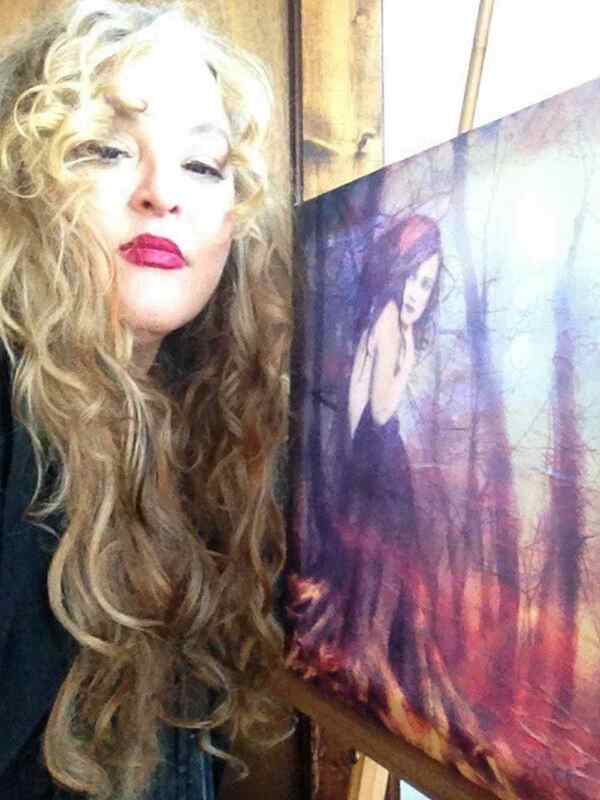 The spiritually aligned, creatives, seekers, mystical folk and women are among those most drawn to what I do. As an entrepreneur, who in business do you admire, and why? I am a woman first, and so much of my inspiration begins there. Women who are doing it, or who did it, their way, and despite the odds. Women who did not or will not take no or an answer. Women who did not have to sacrifice their sensuality or femininity in order to succeed. And women that have touchstoned their desire and framed it as a conscious part of their journey. I truly believe that we are here on this earth as supernal beings with the power of creation within us, and it all begins with desire. So my house of butterflies—the women that deeply inspire me—includes Danielle LaPorte, Mama Gena (Regina Schopenhauer), Vali Myers, Patti Smith, Anais Nin, Georgia O'Keefe, But also Beatrice Wood, Grace Hopper, Oprah and Alexandra David-Neel. Polymaths and visionaries and renaissance souls, all. Aligning the principles of what you want and love in a way that allows you to also bless others. That takes so many forms, but it is truly all about being in service to others while exercising your own gifts in this incarnation. Know your path, know your purpose, know your will, know your time. This is probably the biggest challenge for me, because I tend to completely isolate myself when creating. I live in my own world a lot, which is, to me, a necessary environment for creating. So giving yourself permission to do what you need in order to sustain your creativity is paramount. I try to stay balanced, reach out and get out of the studio instead of holing up for weeks on end. Daily texts and weekly calls to those I love that I’m not physically close to. Holding space always for the people that I love, first and foremost, and then making every moment count while I am with them. Letting them know how much I deeply love them and need them in my life. And forgiving myself in all the places that I fail. Balancing the aspects between creative force and running a business—and I think this holds true for most creatives. I have to push myself to really maintain organization. It's something I struggle with—and it's one of the things I am consciously working towards, always. I keep myself accountable with weekly "check-ins" with other women entrepreneurs, going over what we each want to accomplish for the week. I have a key group of four women who I regularly use as reality checks to be sure I’m on target, and who serve as my cheering section when milestones are reached. I use Evernote a lot for everything, including to-do lists. And I have reams of notebooks where I keep short and long term as well as daily goals. I also use the business principles I learned as a Project Manager to efficiently manage my own projects, from small to large—one of the most valuable skills I gleaned from the corporate world. I'm free-flowing and largely unstructured, so a workday might start at 4 AM with Lapsang and sitars and chants, or it might start at noon with puppy-kisses and Patti Smith. I use dreams a lot in my work, so it isn't uncommon for me to get up at 2 AM and start creating, and then go back to sleep after a few hours. I've found the ways that I work best, and I think the key here is to honor your own flow, and not try to fit yourself into an idea of 9 to 5—something that I really had to unlearn after years in the business world. I do have responsibilities that have to be met each day, and it’s important that I fit those in as well. Regardless, there is always some time spent at the altar, burning candles, giving thanks, centering and grounding, praying for others and remembering the reasons I am here. What I do is very much my spiritual practice as well as my business, and I live my life held within the truth of that. The first day that I worked for someone else. It's funny, because my first real memory was discovering the moon from my bedroom window. I remember thinking that it was the eye of night, and feeling so small within the immensity of that. I felt especially comforted with the blinds open, letting the moon into the room—drawing it down into my own world, so to speak. And so, so many nights I'd spend lying there, looking up at the stars, feeling this sense of vast wonder and knowing that was really home. I think since that time, I've been trying to maintain that perspective of my spirit within this cosmos, which is reflected in everything I do. My father was an artist and operatic tenor, and then later a television personality, and so we lived a fairly bohemian life going from town to town to hear him sing or perform. I have such memories of doing homework in outdoor venues, behind the scenes and sitting under the stars. We had deep conversations, no TV for the longest time, and my Father was a voracious reader who really believed in the power of words. So our lives were richly colored by operas and plays and theater, by long discussions about philosophy and theology. We did not have a lot of money, but it was such a magical home. It was shocking to learn that most families were not like that at all, that they went to work, came home, watched TV and there was very little conscious connection or interaction, let alone discussion. And that always felt so foreign to me—that regimented, button-down vanilla life. I knew that whatever I did, and wherever I landed, I never , ever wanted to be that. I am 100 percent responsible for all aspects of my business, from creating to shipping (and all of the intricacies that lie between). This is probably the year I will have to change that, but I'm very much a perfectionist and so far, have resisted looking for help. I could be much better about that, admittedly. Through the visual manifestation of spirit, to sensually enlighten and inspire each person into the reflection and remembrance of their being and nature, one soul at a time. Anything by Danielle LaPorte, but particularly “The Desire Map.” Alyson Stanfield—she specializes in the business of art, and I love her circular business plan. Maria Brophy, who has been instrumental in helping me understand the business end of art licensing. Also Jane Davenport and Sark—both women in art that are making their own mark in the business of creativity with spirit. And Donald Trump, because as much as his hyperbole irritates me, the man knows how to make deals. He turns business into an art. Love, always. A true north in the cosmos, and a connection to the Divine Feminine. A sense of beauty, tribe, and a place to call home. You are gifted, and the world needs you—it needs your love, your spirit, your light—your unique and exquisite way of seeing things, in a way that no one else but you can see them. Discover your talents and monetize them (hint: It is always, always linked to the things that you most love). If you’ve ever been hired to work for someone else, then you have what it takes to work for yourself. Believe it. Prepare for firm resistance, deep concern, good intentions, laughter, scorn, and even mockery. Accept that, don’t try to make everyone happy and do it anyway. Surround yourself with people who believe in you, and learn from those who are where you want to be. Be curious, ask questions. Start fires. Play. Invest wisely in friends that will support you, celebrate you and cheer you on, but that also will be straight with you when it matters most. Accept that failure—at some point—is a given. Don’t do what doesn’t work, and if it isn’t working then stop. Regroup. Breathe and try again. And never forget: You are magic. Lisbeth Cheever-Gessaman is a mixed-media artist that merges technology with traditional mediums to create new interpretations which serve as spiritual offerings and prayers to the Divine. Using a flexible range of tangible media across a wide range of surfaces and contexts, the work produced is a union of the creative all-soul which explores shamanic and mythological constructs by incorporating art and talisman to create a (third) phenomena, or magical reality. This augmentation of discrete phenomena is dedicated to the celebration of the holy feminine, and an offering of beauty and praise to the sacred, invisible world that gives us life. Connect with Lisbeth on her website, SheWhoIsArt, on Facebook, Etsy, Instagram (@shewhois), Twitter (@isms) & Pinterest (@shewhois).